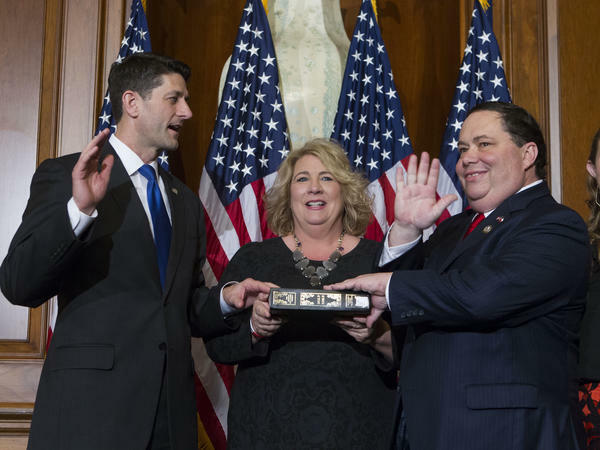 House Speaker Paul Ryan administers the House oath of office to Rep. Blake Farenthold, R-Texas, during a mock ceremony in January. Farenthold reached a private 2015 settlement for $84,000 with his former communications director over sexual harassment allegations. Party leaders played a pivotal role in forcing the resignations of three members of Congress within three days this week, and their work might not be done yet. Two additional congressmen, one Republican and one Democrat, also face allegations of sexual harassment and growing calls to resign, but so far they are resisting those calls. Rep. Blake Farenthold, R-Texas, reached a private 2015 settlement for $84,000 with his former communications director over sexual harassment allegations. Politico first reported on the details of the previously private settlement, including that it was paid for by taxpayers. Farenthold denies any wrongdoing, but announced this week that he would reimburse the Treasury out of pocket. The House Ethics Committee announced late Thursday that it was reviving its inquiry into the allegations, citing more information that has been disclosed and a willingness from Farenthold and his former aide to participate in an investigation. Only two of Farenthold's colleagues, GOP Reps. Barbara Comstock of Virginia and Mia Love of Utah, have so far called for him to resign. The speaker has not called on Farenthold to go but the renewed ethics investigation could affect Republicans' calculations. Democratic leaders have been swift to condemn Rep. Ruben Kihuen, D-Nev., and call for his resignation of allegations first reported by BuzzFeed that he sexually harassed a woman who worked on his 2016 campaign and quit over his behavior. Democratic Congressional Campaign Committee Chairman Ben Ray Lujan and Pelosi quickly called for him to resign over the allegations, but Kihuen is pushing back. "I do find it interesting that the DCCC, Leader [Nancy] Pelosi and Chairman Ben Ray Lujan, they knew about these allegations last year," Kihuen told ABC News. "They looked into them. They didn't find anything, and they continued investing millions of dollars in my campaign. They went out there and campaigned for me." Pelosi and Lujan deny that they knew or that any investigation occurred. There is no clear standard for forced resignations, and there are simmering frustrations among conservatives and liberals alike that lawmakers are being tossed overboard without any conclusive evidence to prove that what they did was wrong. It's further complicated by the argument that some politicians have made — most notably with President Trump in the case of Alabama Republican Senate candidate Roy Moore — that ultimately the voters should get to decide their fates. Capitol Hill has for years been intolerant to lawmakers accused of any kind of sexually charged bad behavior. Already this year, Pennsylvania Republican Rep. Tim Murphy, a social conservative, resigned over extramarital affairs and allegations that he wanted a mistress to have an abortion. While the knee-jerk urge of Congress is to purge lawmakers over sexual impropriety, there is also a long history of lawmakers who have weathered the allegations, won re-election and left on their own terms. For instance, Sen. David Vitter, R-La., admitted to using prostitutes in 2007. He refused to resign and won re-election three years later. He retired on his own terms in 2017. Tennessee Rep. Scott DesJarlais weathered allegations over extramarital affairs and pressuring a woman to have an abortion. He has won re-election three times. Whether or not Farenthold and Kihuen can withstand growing pressure to bow out is an open question on Capitol Hill, and with no clear metric for when a lawmaker should resign, there is fresh pressures on party leaders to be the ones who set the standard.